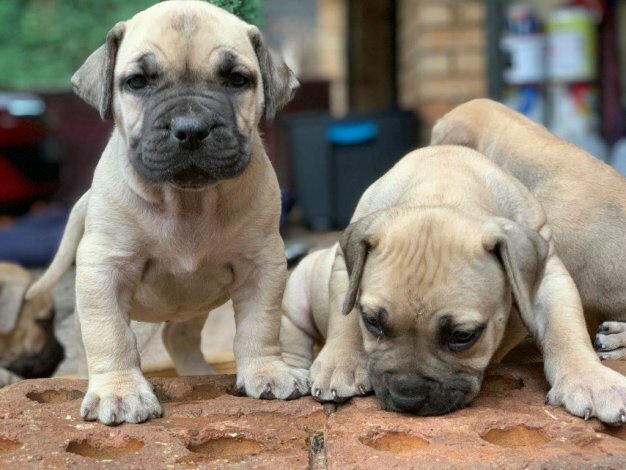 Boerboel puppies are gorgeous when little but big and expensive when fully grown. This is not a dog you want to get if you won’t be training it. Also, don’t get this dog if you expect your kids to do all the training. Kids love dogs on laps, in the house and so on. When this gorgeous specimen is fully grown, you do NOT want him on your lap when HE decides. It should be by invitation only. The other thing to consider is that these dogs needs SPACE to roam around in and lots of food. So you need a decent budget for your housing and food. Yes they’re beautiful dogs and great for protection but they also have needs you should take into account. Boerboels require space. So if you live in a normal house with a wrap-around garden, you should be fine with a Boerboel. But there’s just generally not a lot of garden space in most houses of Johannesburg. You also want to keep in mind that Johannesburg isn’t a very safe city. Dogs get poisoned all the time. Boerboels are big “outside” dogs. If you’re okay with bringing in your dogs at night, they should be safe but then watch them when they go out in the morning as tsotsis might have left poisoned food in the far corners of your garden. This applies to all dogs of course but especially bigger “scary” dogs, in the eyes of the tsotsis. Sometimes Boerboels get abandoned by nincompoops. And sometimes they get rescued by organisations dedicated to rescuing these specific, majestic beasts of love.